How do I send you log files from my L-3 Lynx system? If you have turned the logging switch to ON using the L-3 Lynx status page, a log file will be created that contains various data messages received during flight. The contents of these files are not useful for your needs, but they can be useful for troubleshooting by the ForeFlight Pilot Support Team. If you have turned the Logging switch set to ON using the L-3 Lynx Status page, a log file will be created that contains various data messages received during flight. The contents of these files are not useful for your needs, but they can be useful for troubleshooting by the ForeFlight Pilot Support Team. STEP 5. In the ForeFlight Documents section, click on the L-3 log folder(s) you wish to export. Image 3. Click on the L-3 log folder(s). STEP 6. 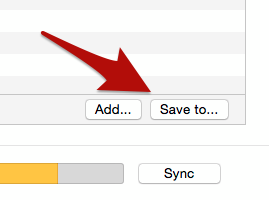 Click SAVE TO in the lower-right corner to save the L-3 log file or click and drag the file out of iTunes to the desired location (Desktop, folder, etc...). STEP 7. Select the L-3 logs folder(s) and then right-click and choose “Compress...” (Mac OS X) or “Send to > Compressed (zipped folder)” (Windows).